Too Many Colds In My Child….. Many parents wonder, “Isn’t my child having too much cold?” as frequent colds are one of the main reason that many children miss their school, becomes tired easily, become cranky and few do not put on weight. Usually, children start to get colds after about six months of age. Babies, toddlers, and preschoolers get about 8-9 episodes of cold a year. During the school-age years, they get average 5 or 6 episodes of cold a year. Teens finally reach an adult level of about 4 colds a year. Some kids get “frequent colds” one after another as isolated episodes which don’t get better on their own and affects the quality of life in many ways. The cold symptoms linger and last for a long time. Often their colds will turn into ear infections or sinus infections, and won’t get better until antibiotic is given. 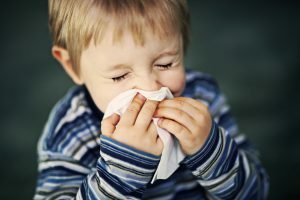 Why my child is getting frequent colds ? Children are more prone to infections because of their developing immune system. Initially, kids are not immune to most of the viruses and bacteria present in the environment. Once they get infected they become immune to that virus or bacteria. So next time when they are exposed to same virus or bacteria their immune system fight against that particular infection and hence children get fewer colds as they grow older. Genetic Tendency: Family history of frequent cold, allergy, asthma etc. Usually, the common cold is caused by the infection of a virus that affects the nose, throat, and sinuses. There are about 100 different types of viruses in the environment. In some children reason for the recurrence of infections is that the immature immune system is not getting a chance to develop natural immunity, as these kids at the slightest sign of infections are being over-medicated by anxious parents and some physicians. Is your child suffering me tonsillitis? Read all about Tonsillitis here. What symptoms should be observed in my child? Running noses are typical of colds, followed by nasal congestion, sneezing and sore throat. These symptoms are seen 2-3 days after infection. Colds usually last for ten days but can also last till two weeks. Sometimes a mild fever accompanies the cold and children may be more tired than usual with low appetite, these infections generally don’t require much treatment and go away on their own. High-grade fever: Rising fever or fever lasting more than two days in a child of any age. Infection that causes colds is spread from person to person through tiny droplets of mucus that enter the air from the nasal passages of infected persons and are inhaled by others. Colds can also be spread by touching surfaces that have been contaminated by contact with infected persons and then touching your mouth, nose, or eyes. The habit of washing hands plays an important role in preventing cold. Teach your kids to wash hands after sneezing, coughing and touching face. You must also wash your hands before coming close to your child if you have a cold. Use hand sanitizers or alcohol-based wipes to clean hands in absence of water and soap in the case of a cold. Teach your child to cover his mouth with a handkerchief if he or she has a cold. Avoid sharing toys with very small children, which are not cleaned. Give proper food to your child as many foods have key vitamins or antioxidants which are helpful in fighting off infection. Can Antibiotics be used to treat colds? Antibiotics are of no use for treating in many cases of colds as colds are caused by viruses and not bacteria. Using antibiotics unnecessarily will result in antibiotics resistance which will prove to be harmful in the long run. Hence do not use antibiotics for colds unless it is some bacterial infection caused due to the cold. Is Homeopathy a good option? Homeopathic medicines enhance the healing power of the immune system of your child, which in turn makes the child less susceptible to the allergens, frequent infections, and the environment. Homeopathic medicines, when taken under the proper guidance of an expert, can reduce the intensity, frequency, and duration of episodes of frequent colds. There is little logic in treating merely the symptoms such as running nose; sneezing and nose block using antihistamine medicines. This problem of frequent colds is deeper rooted and needs to be addressed at the root level. The Homeopathic medicine addresses the genetic predisposition and believing in treating the disease at the root level, hence improving the quality of life of your child. Can it help during an acute attack of cold? Homeopathic medicines are aimed at boosting long-term immunity. They may not help during an acute attack of cold. During an acute episode, you can give your child conventional medicine, without stopping homeopathy. Ultimately the dependency on conventional medicines can be reduced to a significant level with homeopathic medicines. If you want your child to get treated with research-based medicines of Dr. Shah do feel free to get in touch with Dr. Rajesh Shah’s associate doctors at Life Force Homeopathy or just send your query here.